With Calxa Premier you can flexibly arrange your chart of accounts for reporting. An Account Tree provides this flexibility by allowing you to save different views of your chart of accounts. You can re-group and re-order while maintaining the integrity of your reports. It is not possible to change balance sheet account types while P&L accounts may be changed within the same credit/debit type which is defined as a migration group. Accounts may only be re-allocated within their migration group which is defined below. Using the drop down menu associated with the create or edit icon ( ) and select Fully Unallocated. This means that we are starting from scratch with nothing pre-allocated. To add a Child under the Header Account, right click on the Header Account and select Add Child. Type an account number and account name in the fields provided and click OK: Note that the account number and name are independent of your accounting file. You can use any numbering sequence and detail accounts do not need to follow header accounts numerically. To add the detail account to another account type within the same migration group, right click on the unallocated account and using the Allocate To menu select the account type to allocate this detail account to. Repeat this until all of the detail accounts are allocated to header accounts as per your needs. 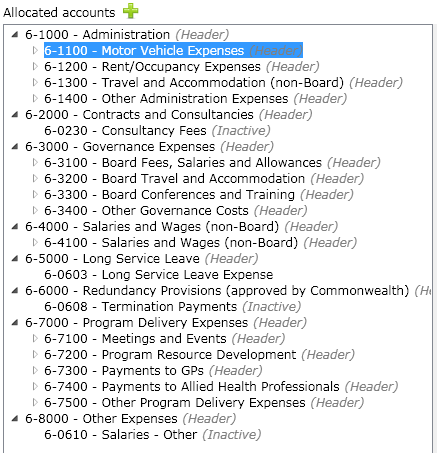 Unallocated accounts will appear in your reports under a header called "Unallocated Accounts". Now that we have a saved Account Tree you can use it for reporting. 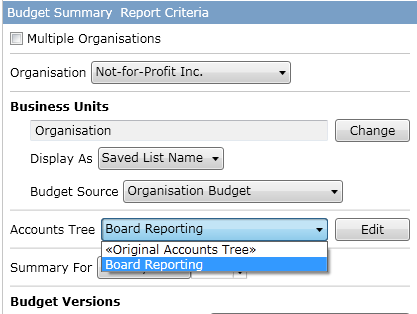 In the Report Criteria section locate the Account Tree drop down menu and select from your saved Account Trees list. 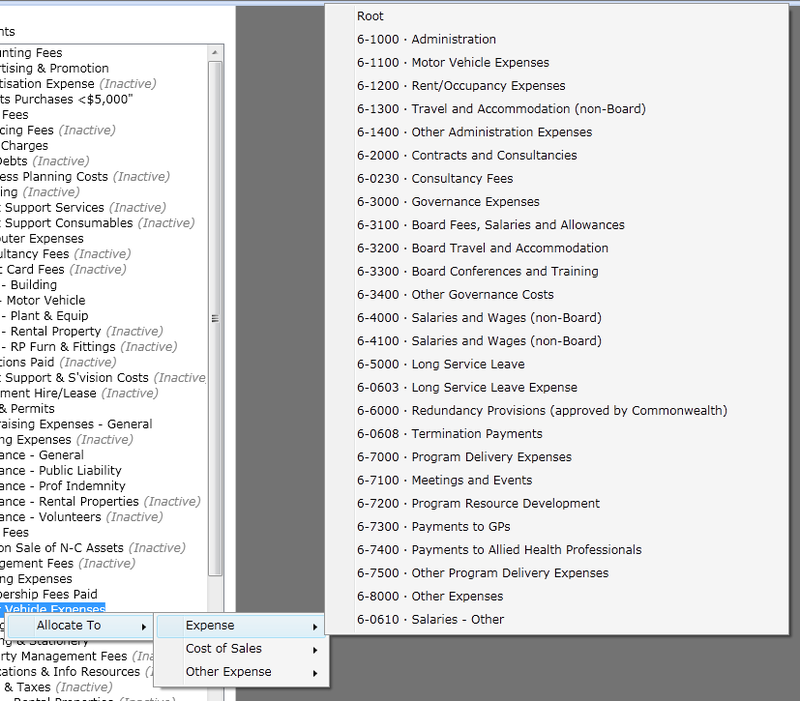 Note – Original Account Tree represents your accounts as they appear in your accounting file. Depending on the level in your child accounts you may wish to adjust your Account Level setting in Common Settings. To display the top header accounts only select level 2 or to display another level of child accounts then select level 3 and so on. Click Display report. 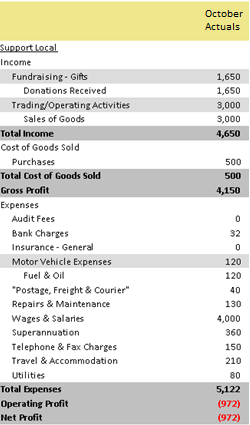 Below is an example of a saved Account Tree in use. On the left is the original account tree and on the right is the saved account tree. As you can see the report integrity remains while providing a very different view of the data. In the Account Trees screen there are a number of tips and tricks you can use to help make creating and editing Account Trees easier. 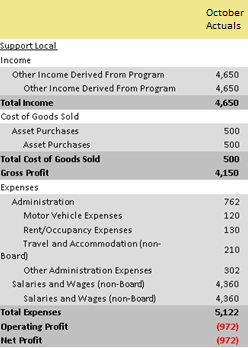 Drag and drop methodology can be applied to detail accounts. Click on a detail account and while holding down the mouse button move the account to a new location. This can be used to allocate or unallocated an account between the unallocated account and allocated account lists or it can be used to move an account between headers accounts. Multiple accounts can be edited using Shift and Ctrl methodology. Hold the Ctrl key while clicking multiple accounts. Selected accounts will be highlighted in blue. You can use this in conjunction with the drag and drop methodology or right click to use the menus. Hold the Shift key and select a start and end account to select a range of accounts. If you have more than one organisation in your Calxa database, you can copy the account tree from one organisation and copy it into another. 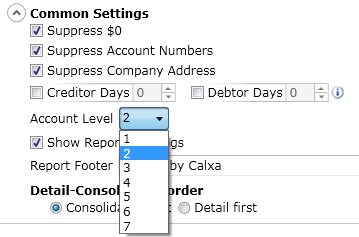 This function can be found in the Create New options when creating a new account tree. The Copy Account Trees window will appear. 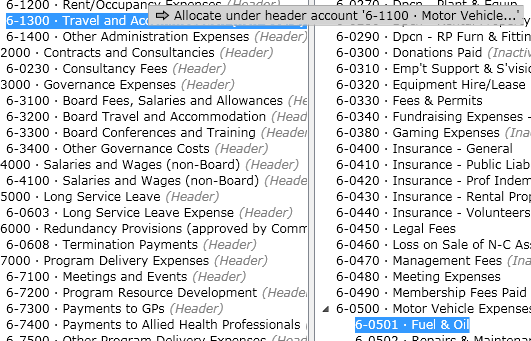 Click the Organisation dropdown and select the organisation that contains the account tree you require and then select the appropriate Account Tree from the Account Tree list. 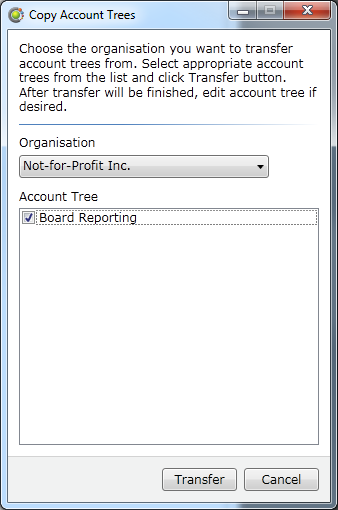 Click the Transfer button to copy the Account Tree to the other organisation. The account tree will be copied over, even if the account structures are not identical. Any accounts that are not in the account structure will be in the Unallocated Accounts list.